Joe Abercrombie's earlier works turned inside out all of my expectations for character development. Instead of character development, the heroes in his First Law books, Best Served Cold, and Red Country all suffer from character regression. People are downright bad. Vile. Morally challenged. Dare I say evil? But with a desire to redeem themselves and better their situations... until they realize it is futile to escape from who they really are. This formula shocked me, and and made me an instant fan. But after six books of the same formula, I grew somewhat bored. Granted, Abercombie's books featured tight prose, hilarious anti-heroes, and truly poignant writing. But he began to feel like a hack. A great hack. The Stephen King of hacks, but a hack nonetheless. 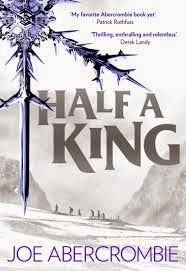 So I was excited to see what he would do with Half a King, a novel that is purportedly geared at a YA (young adult) audience. This alone is a big change of pace for Abercrombie--an attempt at grimdark light! If anything, with Half a King, Abercrombie exceeded my expectations. Everything that I like about his writing remains unchanged. Half a King is laced with lighthearted cynicism, punctuated with laugh-out-loud hilarity, and features some of the brutality that fans have come to know and love. But what he changed is even more important. Abercrombie dumped his traditional, grit-laced formula to tell a coming of age story set against a dark background. Oh happy day! The story centers around Prince Yarvi, a weak young intellectual (with half of one hand) and second in line to the throne who was born in an era dominated by the sword. He thus spent much of his life shirking his military responsibilities and learning to become a Minister, an advisor to the kings that reminds of the Maesters in GRRM's A Song of Ice and Fire. But the death of his father and older brother force Yarvi to take the throne and begin a quest for revenge, a quest that pits him against enemies from both near and afar. Yarvi soon learns that although he lives in an era of the sword, to get by he must hone his wits. He is helped along the way by a motley group of truly likable characters, from the oarsmen Rulf and Jaud to the beautiful navigator Sumael and the swordsman Nothing. And his wits are further honed by his truly likable (!) enemies, some who bring to mind the comic thoughtfulness of Nicomo Cosca. It is this honing of his wits that turns Yarvi from adolescent boy into a thoughtful young man, one who realizes that he could have a good life ahead of him, and that his own worth does not center on his half a hand. Perhaps this coming of age story is the only YA aspect of this novel (aside from the light word count). In fact, I am honestly surprised that Half a King is being marketed as a YA novel at all. It is almost wholly unrecognizable as YA fantasy. Half a King does feature teenage angst, but it does so against a grim, dark, and brutal background that would give me pause before recommending it to a young audience. Instead, this should be seen as the Pinot Noir of Abercrombie. Classic, but mild and somewhat toned down. I imagine tried and true Abercrombie fans will be outraged by his selling out to reach a bigger audience. But if anything, this book has made his writing more accessible to a broader audience. With Half a King, Abercrombie is trying to sell the love, and I would be surprised if it does not sell wildly. Highly recommended. This is his best book yet. Penalties: -1 for not really being a YA novel. Nerd Coefficient: 9/10 "standout in its category"